Spectrin is an actin binding protein that is a major component of the cytoskeletal superstructure of the erythrocyte plasma membrane. Spectrins function as membrane organizers and stabilizers by forming dimers, tetramers and higher polymers. Spectrin α I and spectrin β I are present in erythrocytes, whereas spectrin α II (also designated fodrin α) and spectrin β II (also designated fodrin β) are present in other somatic cells. The spectrin tetramers in erythrocytes act as barriers to lateral diffusion, but spectrin dimers seem to lack this function. Defects in the SPTB gene encoding spectrin β I are the cause of spherocytosis type I (SPH1), a disorder characterized by severe hemolytic anemia. Another disorder due to defects of SPTB is called elliptocytosis or elliptocytosis 3 (EL3). The human SPTB gene maps to chromosome 14q22-q23.2 and encodes the 2,137 amino acid, 246 kDa erythroid form of β-spectrin. 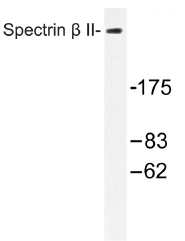 Western blot (WB) analysis of Spectrin β II antibody (Cat.-No. : AP01504PU-N) in extracts from COLO cells. 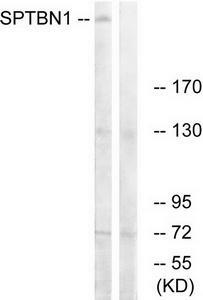 Western blot analysis of extracts from COLO cells, using SPTBN1 Antibody. The lane on the right is treated with the synthesized peptide. Western blot analysis of extracts from COLO cells, using SPTB2 antibody.The lane on the right is treated with the synthesized peptide.